A Summer trip to Barcelona is the perfect opportunity to combine sightseeing with some fun activities by the water. The Mediterranean sea offers lots of opportunities for sunbathing, relaxing by the beach, going sailing and also practicing all kind of fun water sports. But while some of these Barcelona beach activities can be easily played by ear (like let’s go to the beach in the afternoon to freshen up after all the morning walking around), other need to be planned ahead of time to avoid disappointments: the activity might be booked up for your available time, or you might have another plan for precisely the time they are running the activity. So if water-based sports are your kind of thing, make sure to spice up your Barcelona trip adding them to your schedule. Today we’ll help you navigating the local offer. Let’s start our list with the quieter experiences: Paddle boards are a traditional sailing form original from the Polynesia that has made our coasts recently and quickly become a trend. You are standing on a surf board and use a paddle to propel yourself. It’s relaxing, yet it’s good exercise and makes you work on your balance and stability. In the other hand, canoes might give you a sense of more safety, and roaming is also loads of fun. A kayak will also take you further away, so you’ll be able to enjoy a larger variety of views over the city skyline. Both activities are provided by the Municipal Sailing Center of Barcelona, and with adequate equipment and swimsuits they can also take place in colder months. By the way, if you are staying at the W Hotel, don’t miss their special yoga classes on paddle surf boards. You might have seen those parachutes flying over the waves, propelled by a motorboat some time at the beach. And you might have envied them, haven’t you? Well, at least, I have! According to the experts, it is completely safe to do, much quieter and relaxing than you’d expect, and the views you get from the top are just spectacular. The kind of activity that will create a unique memory of your trip. 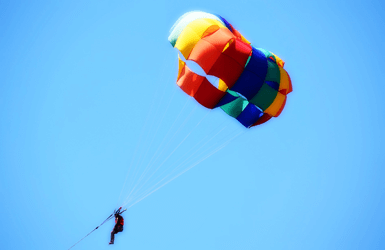 And did you know the parachute can seat more than one person? So you can do it together with your hubby, friend or child – that’s double fun! In Barcelona we know two companies: this one operates also in the winter, their parachutes go upto 85m (280 feet) and they only accept people over 16 years of age, while this other one operates only in the summer and their parachutes go twice as high. The flights last for about 15 minutes in both companies. The ideal activity for motorbike fans that want to transfer their passion for speed and driving to the water. Some jet skis can be shared by two people, and if you are a group, booking several of them to go rushing across the waves can be such a fun idea! You’ll be able to go jet skiing in Barcelona along the local coast while enjoying the views and the speed, and feeling the sea spray over your skin. This company runs jet ski outings lasting from 30 minutes to 1 hour, while this other company offers the possibility to combine a 30 minute ride with a Flyfish ride (see below). In both cases you’ll be escorted by a specialized guide for safety reasons, as those jet ski models don’t require you holding a boating license. Ok, I agree: the Mediterranean sea isn’t the Caribbean or the Maldives. Our see is deeper and darker, and the fish aren’t as colorful. You won’t get to cross a shark or a dolphin either. But what about the emotion of being underwater and feeling like a mermaid? Listening to the silence only broken by the bubbles and the sound of your breathing. Fish schools swimming past you. Seaweeds and corals rocking to the water currents… A short train ride will take you to Mataró, a small town North of Barcelona where you can get your scuba diving debut: an introductory course and a boat trip with immersion – all lasting for about 3 hours. You are likely to see starfish, anemone, lobsters and the occasional octopus, moray or sting-ray. A fly fish is an inflatable raft for upto 6 people that is attached to a motorboat. As soon as the boat engine starts, the fly fish raft starts jumping and flying, landing and taking off over and over, so you feel as if you were a real flying fish. Lots of fun for those loving speed and the scariest rides in amusement parks. You just won’t get to enjoy the coastline views much, though! But laughs and adrenaline are guaranteed. Definitely not for you if you have a tendency to get seasick. This company runs 15 minute fly fish rides, that can be combined with jet ski outings. AND BONUS! What about water skiing in Barcelona? Water skiing sounds like the perfect alternative to snow skiing when the Summer arrives. However, it is a sport that requires being in good shape and having very good balance skills. It is not something that can be offered to anyone wanting to try once, but rather a sport that you need to practice regularly to be able to master it. 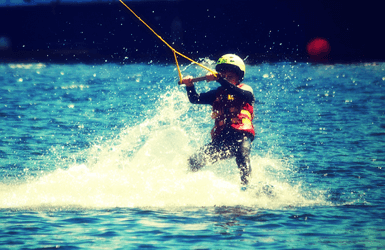 If you aren’t new to water skiing, though, you can head to the Canal Olimpic in Castelldefels to practice it (you might be required to show some kind of license to prove you know what you are doing). The canal can be reached by the L95 suburban bus departing from Plaça Catalunya (as the Castelldefels train station is too far from it). So what about you? Head to the comments below and tells us: are you considering practicing any water sports in Barcelona and which one? WHERE TO WATCH FOOTBALL IN BARCELONA?